Hiya my loves, I hope you’re all well! Many months have passed and there have been multiple little additions to the family (congrats to my sisters) and a whole new theme to the blog which we are all SO happy with. 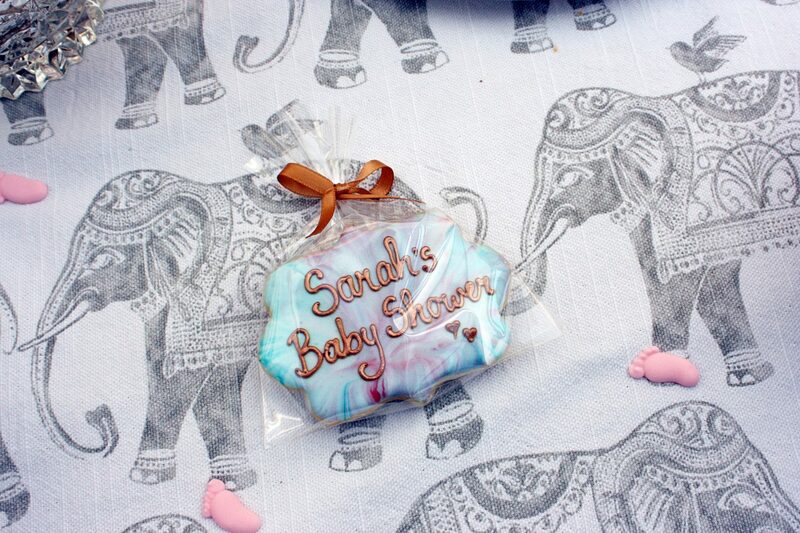 Today I’m sharing pictures and details from Sarah’s Baby Shower – seen as the little one has become the centre of our lives and we are all obsessed with her I thought it was only fitting to start back on the blog with the baby shower! After creating a whatsapp groupchat between Sarah’s sister-in-law’s, Sonya and myself, we began to discuss the overall themes we were wanted for the baby shower and then went on to allocate jobs between us. We were sure on the general vibe we were going for from the beginning, which was small and intimate. 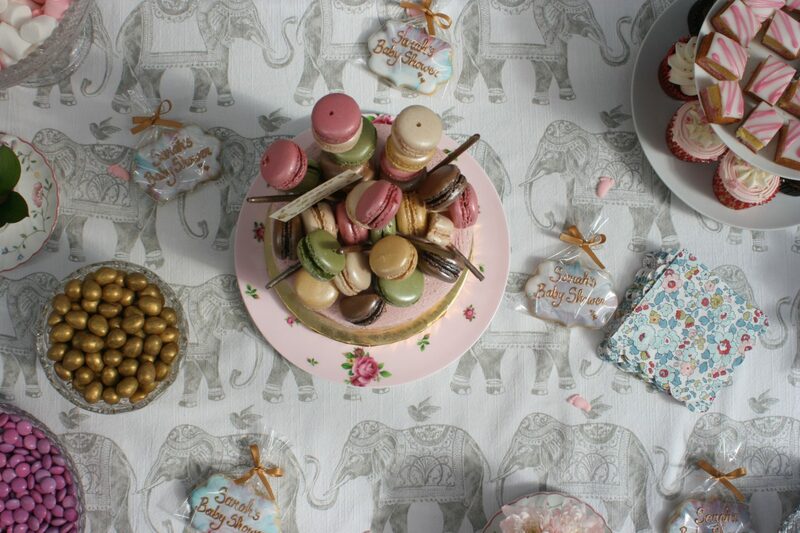 We aimed to centre this vibe throughout the baby shower prep, even though it became extremely hard to hold back the urge to go OTT on decorations and cakes, we managed to keep our heads. 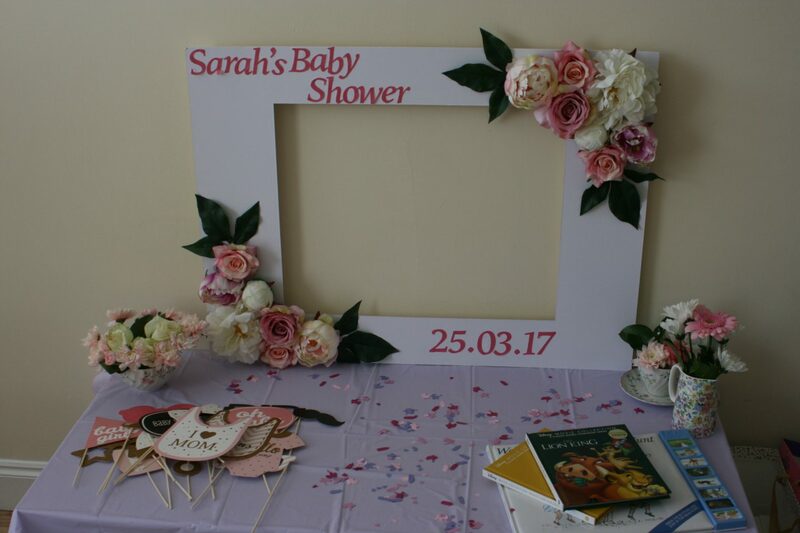 It’s so easy to get carried away with any event especially when you’re starting out on your own by scratch, although we wanted to incorporate our own personal touches to the baby shower we wanted to keep it relatable to Sarah and what she would like. 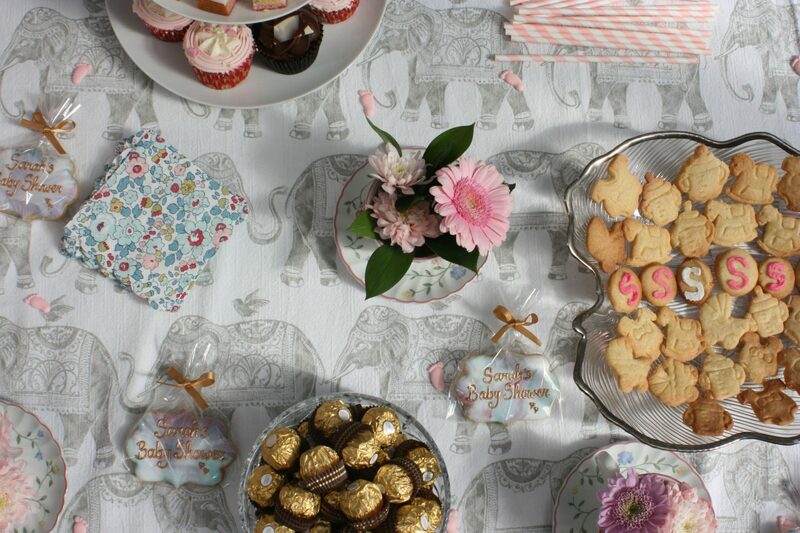 We opted to hold the baby shower at Sarah’s house to maintain the homely vibes, as there was only a handful of friends and immediate family invited, Sarah’s house was the perfect location of cosiness. 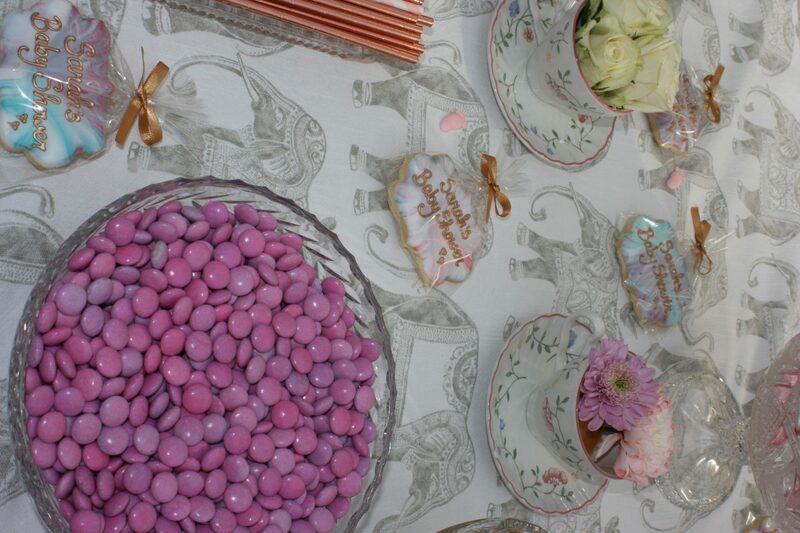 As for the decorations we wanted to keep a broad colour scheme of rose golds/coppers, pinks and whites. As we knew Sarah would be having a little girl we wanted to incorporate pinks without bombarding the whole event with ‘It’s a girl’ balloons. 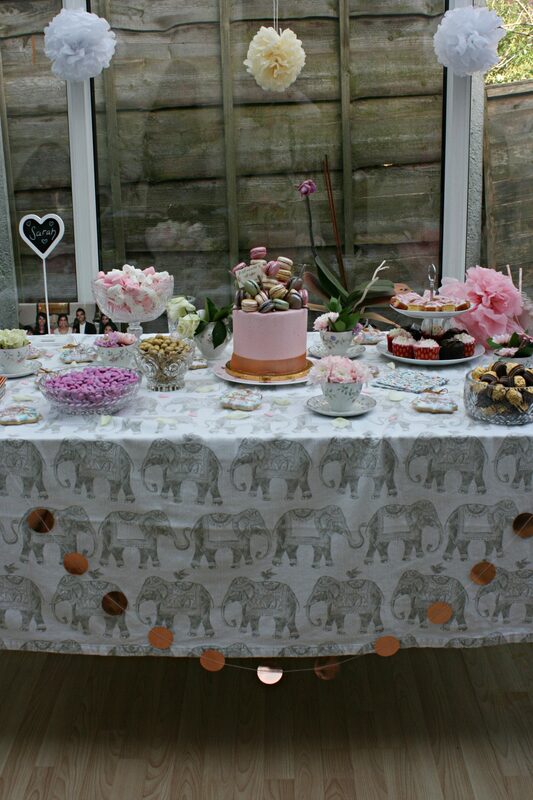 We ended up for the main focus of the event as a desert table, after scrolling through inspiration on Pinterest (which was our initial step once we decided we wanted to plan a baby shower). 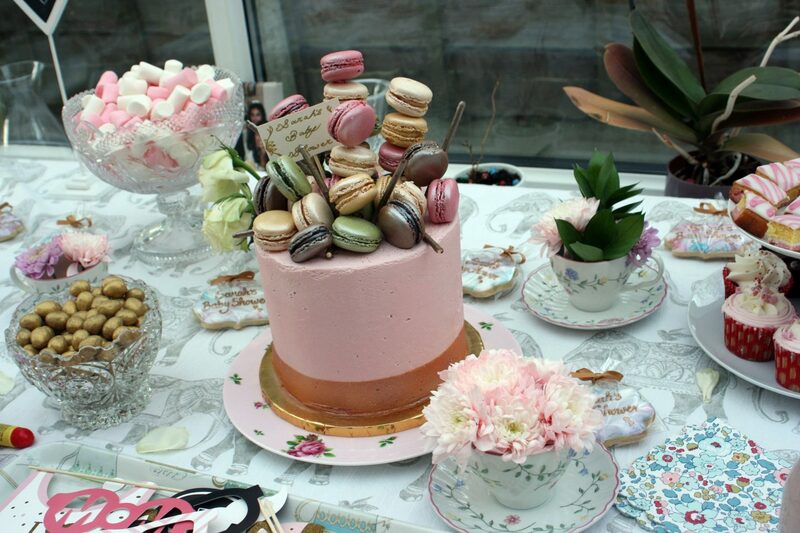 We saw multiple pictures of ‘garden party decorations’ which caught our eyes, we kept coming across flowers within tea pots and mugs dotted around tables and knew we wanted to recreate them! – Check out our pinterest for inspiration! After some brainstorming and a lot of help from our Mum, we dug through my grandma’s collection of mugs and tea-pots to find a floral set. We then wanted the flowers to stand up and last throughout the whole event and after looking at some more inspirations. We came across an article piece which showed Mother’s Day decorations. 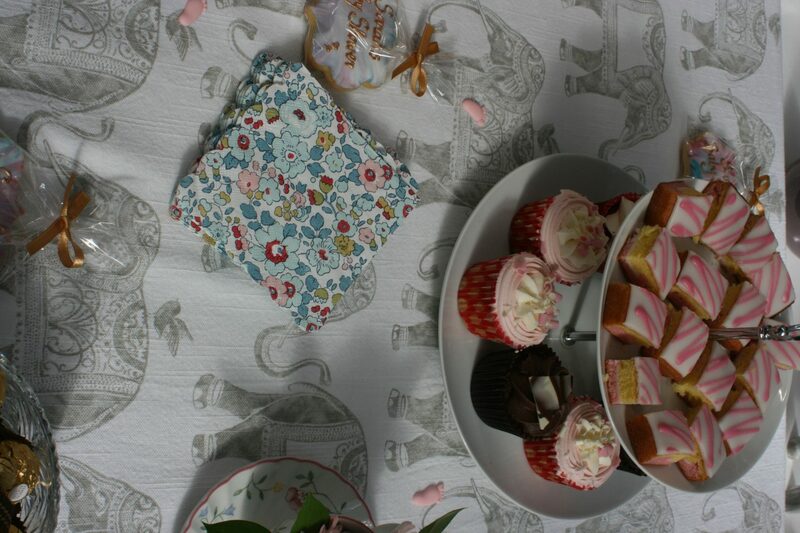 We put one fairy cake in each mug/tea-pot and then fed the stems of the flowers through the cakes which held them up right. Once we decided to arrange the flowers in this way, we went the day before to Tesco and bought a few bunches of flowers and arranged them the morning of the event. Alongside the flower arrangements, we bought some pink, white and cream pom-poms from Amazon made from tissue paper which we hung around the main room of Sarah’s house. After looking through VanityFemme’s Bridal Shower, we fell in love with the cut-out frame for pictures, but decided to pass the duties on to Simran (Sarah’s best friend) who managed to make the cut-out perfectly! It was honestly beautiful and exactly what we wanted. Alongside this, we ordered some party-props for some funny photo’s to use alongside the cut-out frame. 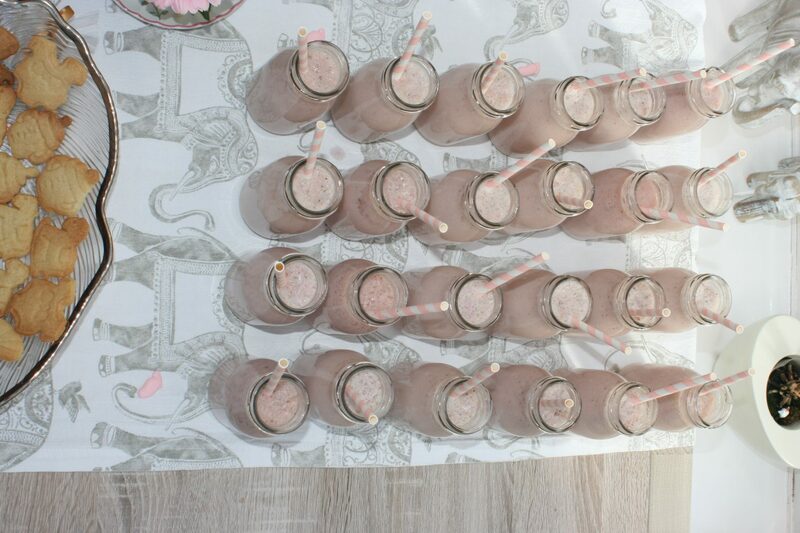 After using baby bottles for Sonya’s baby shower we definitely loved the idea and thus ordered some more off Ebay and made some strawberry milkshake to have inside them and added some pink/white striped straws and line them up on the side of the desert table! This doubled up as décor as well as a cute drink for the guests. 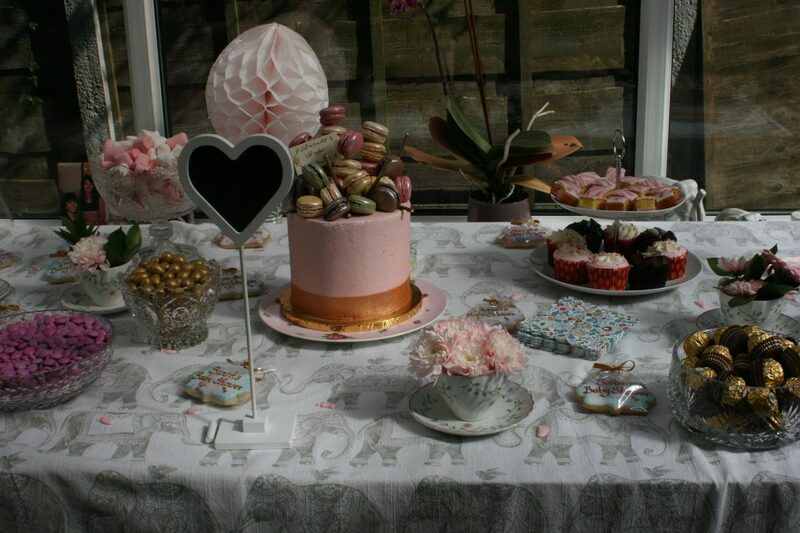 As well as all this, we put some pink smarties, marshmallows, angel slices and cupcakes in plates around the table too! 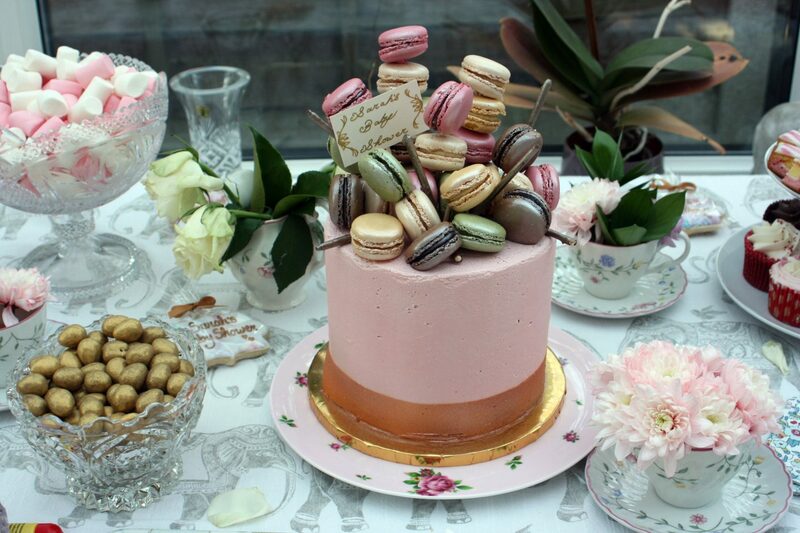 These all centred around the cake made by Jedelle Cupcakes – this cake was amazing, after looking through her IG page we fell in love with the macaroon detailing on top so decided on a cake with pink base and macaroons on top! It came out perfect and we couldn’t recommend her more!! 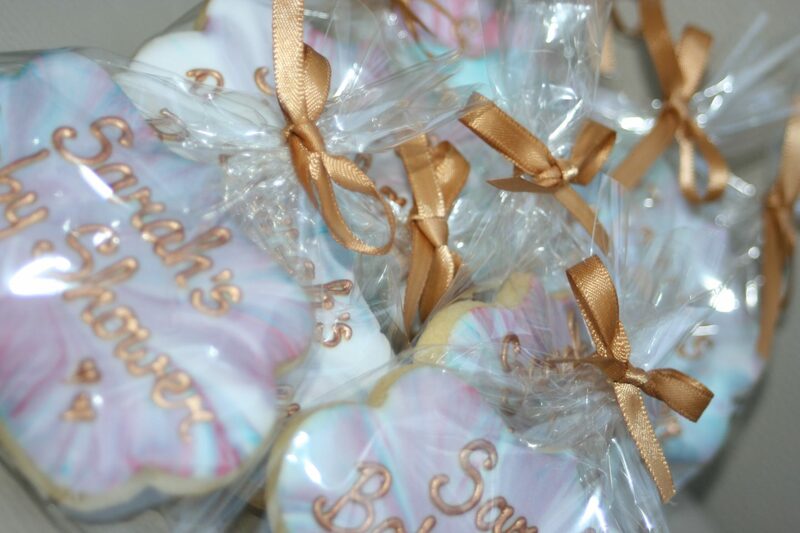 Alongisde all this, we also decided to order some personalised biscuits with ‘Sarah’s Baby Shower’ on them for all the guests to take away with them – there are many companies on Instagram which you can order biscuits/cakes from, personally we wouldn’t recommend the company we used but there are many other places which are local to order from! During the summer a couple of years ago, I stumbled across a recipe for a mint mojito drink and as it turned out to be a lovely sunny day, I decided to make a whole lot of it to be distributed out in the drink dispenser. Many people asked the recipe for this and I will include it in a separate blog post soon! 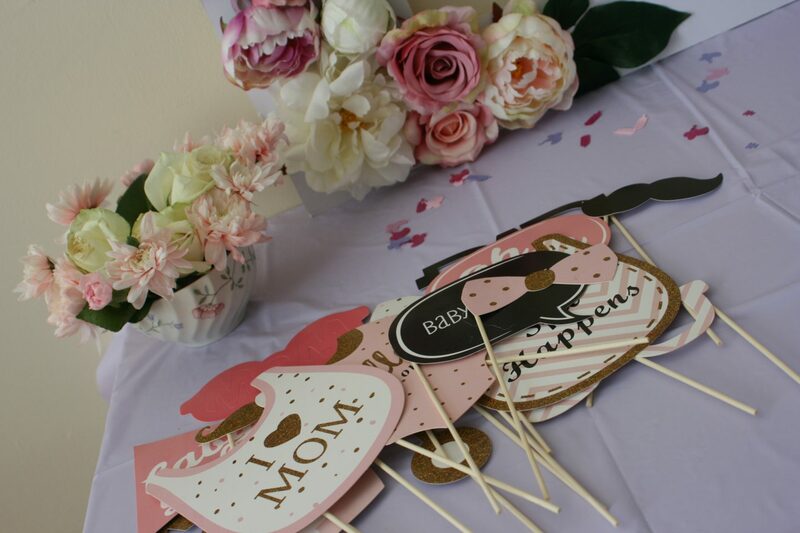 Overall, the whole baby shower was a completely perfect event and all the hard work was paid off! But boy it was HARD WORK. Up next will be the outfit I wore on the baby shower!